This last post on summer recipes is dedicated to my Uncle Bill. He passed away yesterday. Uncle Bill was a cook for the military for over 30 years. He could do just about anything in the kitchen, but he could really throw down on some ribs. He was a kind man and I will miss him. I’m still working on “eating healthy” (blah). I found this smoothie recipe in a local paper. I Googled and I guess this drink is popular with health folks, which ain’t me. Ingredients: 2 frozen bananas, skins removed and cut in chucks, 1/2 cup frozen blueberries, 1 cup orange juice, 1 tablespoon honey (optional), and 1 teaspoon vanilla extract (optional). 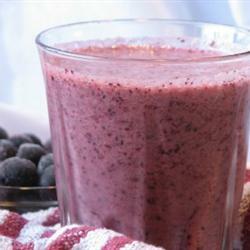 Directions: Place bananas, blueberries and juice in a blender, puree. Use honey and/or vanilla to taste. Use more or less liquid depending on the thickness you want for your smoothie.